When the weather gets warm, I prefer lighter meals for dinner. 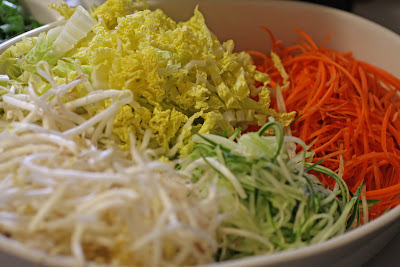 Somen noodle salad with vegetables is something my mother would make as a change-up to her usual routine of serving cold somen (or soba) with just a dipping sauce. This dish is so easy to make, and it really is a perfect meal on a hot summer day. Cook the somen noodles according to the directions of the package. Drain the noodles thoroughly under cold water. Toss the somen noodles in the dressing. 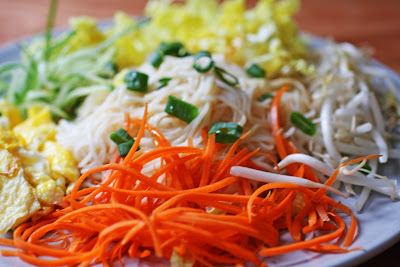 To serve, place the somen noodles in the center of a plate and arrange the carrots, cucumbers, bean sprouts, cabbage, and egg around it. Garnish with the green onions.